1/17/2019 by Natalie Jarvey, The Hollywood Reporter. Revenue for the final three months of the year was up 27 percent to $4.19 billion. Netflix’s price increase wasn’t the bellwether that some analysts were anticipating. Two days after announcing that the price of its most popular U.S. plan would go up by $2, Netflix revealed that it has grown its subscriber base by 8.84 million, or nearly 26 percent. The jump, which puts it at 139 million subscribers worldwide, was a record for the streaming giant but still off slightly from the more than 9 million that Wall street was expecting. Broken out, Netflix added 1.53 million subscribers in the U.S. and 7.31 million subscribers internationally. 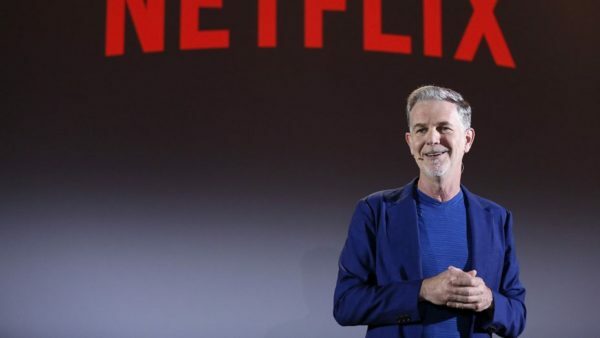 Some investors were hoping that the pricing news was a sign that Netflix would significantly beat its previously forecast subscriber growth, and when that didn’t happen, they sent the stock down as much as 4 percent. Netflix is forecasting that it will add 8.9 million subscribers during the first three months of 2019, that’s 1.6 million in the U.S. and 7.3 million abroad. Revenue for the final three months of the year was up 27 percent to $4.19 billion, a slight miss from Wall Street’s expectations, and earnings came in at 30 cents per share. Analysts were looking for revenue of $4.21 billion and earnings of 24 cents per share. Annual revenue grew 35 percent to $16 billion during 2018 and operating profits nearly doubled to $1.6 billion. Netflix must continue to spend big on programming to keep subscribers engaged with its service and prevent churn. The company’s annual content budget, which includes licensed and original projects, was expected to reach as much as $8 billion during 2018. Investors cheered the price increase as a sign that Netflix, which is currently burning through cash, is committing to covering those growing programming (and marketing) costs. Good for Netflix. We dont need or require this service, Crave, or any other service. I find it interesting, most will pay no matter what it costs, at least thats what they are saying today. Enjoy it everyone. Christine Williams, pardon my naivety but dont most people that use netflicks do so to scrap their cable provider thereby saving a lot of money? 13- Netflix is the vacuum that we have been craving for the last ten years, sorry not I. The cable company provides a good service for me and my family. I dont sign up to companies or corporations just because everybody else does. Already the complaining has started regarding Netflix, eventually the numbers wont be increasing for them, as they reach a plateau, and eventually their numbers will fall. Remember Blockbuster! As a Netflix subscriber, I maintain my cable subscription to follow certain network programs and news offerings. I use Netflix for offshore shows that provide a different approach than North American stations. What I find particularly attractive are the Netflix original films and documentaries. Many of them feature content that is up-to-the-minute. Theatre films are not far behind their initial release either. Thanks, Netflix.